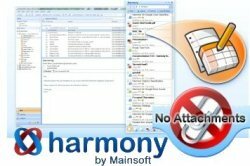 If you use outlook as your email client and use Google Doc’s for your online backup of documents then this MS Outlook addon called Harmon.ie ( Pronounced Harmony ) for Google Docs which can save lots of time attaching files and collaborating documents using Google Doc’s. 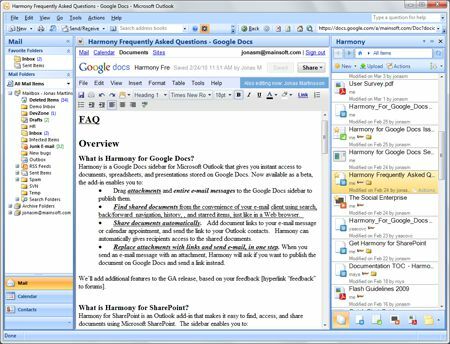 Harmon.ie is a free sidebar for Microsoft Outlook that gives you full-featured access to documents, spreadsheets, and presentations stored on Google Docs.It also allows uploading and downloading attachments to/from Google Doc’s. Upon installation it adds a sidebar that allows us to access online documents from virtually any screen in Outlook.In case you add files from Google Docs as attachment to your mail it sends your Google Doc links instead of attaching files directly from your e-mail saving time. If you attach a new file Harmon.ie will ask if you want to upload these attachments to Google Docs and send links to files uploaded to the recipient.Files can be easily uploaded to Google Doc’s by simply dragging and dropping the file(s) from desktop or email attachments files which would automatically be uploaded to your Google Doc’s account.To download files from Google Doc’s just drag the files from the Harmon.ie Outlook sidebar to the desktop. Save Google documents in Microsoft Office format. 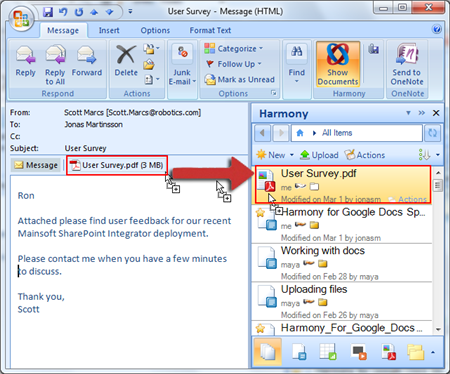 The only restriction being that the recipient needs to also have a Google account to access the document on Google Docs.Google Doc’s can be opened and edited in Outlook and re-uploaded easily.Harmon.ie can export documents to Google Office, OpenOffice, PDF, RTF, HTML, TXT and image formats. 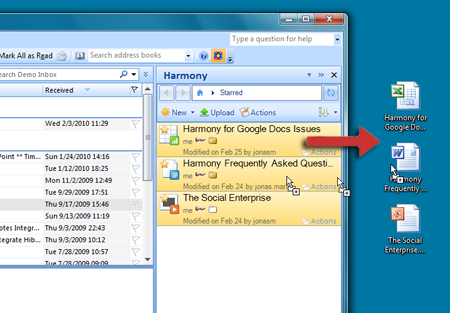 Harmony supports Outlook 2007 or 2010 and is compatible with Windows OS.